Windlass Steelcrafts is proud to bring you a new selection of medieval swords, daggers and axes called the Battlecry Collection. This line is designed specifically to be used and is made from the toughest materials, such as 1065 high carbon steel. Every piece goes through rigorous testing. Each weapon has a darkened, battle-hardened finish, extra wide tangs, tempering to low 50's RC and comes pre-sharpened. And, the "hands-on" nature of the manufacturing by master smiths, makes them truly unique. This is a line that screams, “TEST ME!” Each weapon includes custom packaging, a Certificate of Authenticity signed by each smith that touched your blade through the forging process and a matching scabbard and frog, which will allow you to wear your sword. We invite you to watch our videos, which will demonstrate the true power of Battlecry by Windlass! Available from Museum Replicas Limited and other fine retailers worldwide. This one-handed sword has a 1065 high carbon steel blade. Features an intricate steel basket guard and a wooden grip covered in real ray skin with a decorative silver metal wire. Overall: 39-1/2 inches. The Crecy is a 15 inches long, hard-nosed, no nonsense double edge dagger for the fighting warriors. Weighing around 1 lb/ 16 oz, the dagger is forged with 1065 high carbon steel blued patina to make it last longer. Designed specifically for battle, this beautiful 1065 high carbon steel war hammer has gone through rigorous testing to be a part of the Battlecry line. This 44-1/4 inch hammer has a 9 inch head and weighs only 4 lb / 2 oz. 21-1/2 inches long, Viking seax were the befitting side arm of free Norse men of the 10th Century. Weighing around 1 lb / 4 oz, these masterpieces are hand-crafted with tough 1065 high carbon steel by experienced smiths. Be battle-ready with this durable, expertly sharpened, stone washed blackened finish, battle tested, 47-3/8 inches long-bladed war sword weighing around 2 lbs / 14 oz. 31-1/4 inches long single-headed axes popular among the mounted warriors of the Middle Age. Each axe weighing around 3 lbs, is individually inspected to ensure that it is as strong and finely made as the warrior carrying them. Planning to re-enact the Battle of Agincourt? 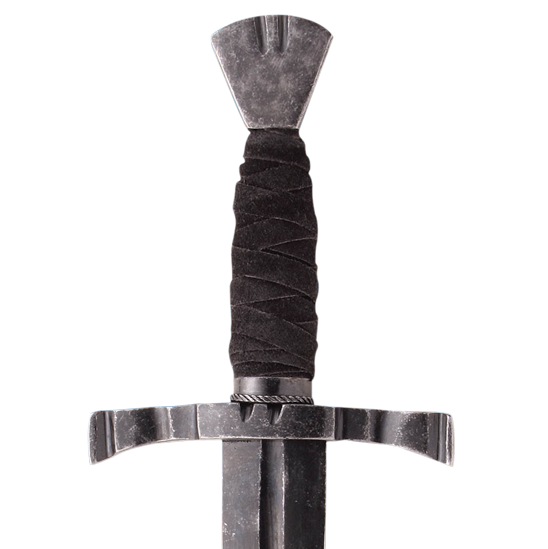 Get this durable, 39 inches long, battle-tested 2 lbs / 8 oz war sword, that comes with a stone washed black finish to impart them a dramatic look. This 36-1/2 inches long sword is the mark of a Viking age warrior. Each of these swords weighs around 2 lbs / 6 oz and is created by experienced smiths to the exact specifications of the original. Each of these Medieval Falchion swords, 30-1/2 inches long and 2 lbs / 14 oz heavy, undergoes rigorous tests to ensure they exceed the industry standards. 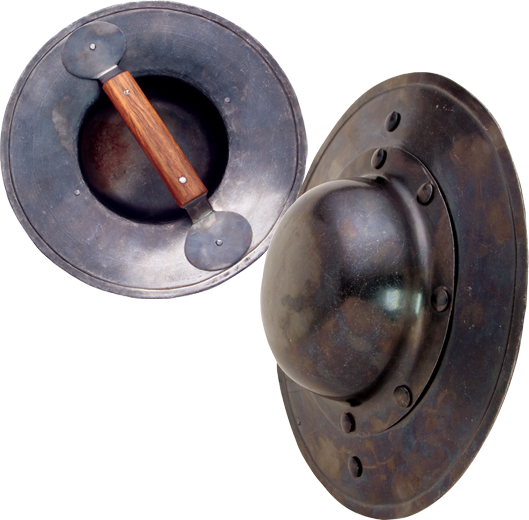 For a finishing touch to the warrior look, carry this small, battle tested, light-weighted shield. The 12-1/2 inches long shield weighs around 2 lbs / 12 oz, offering great flexibility to the warrior during a combat. 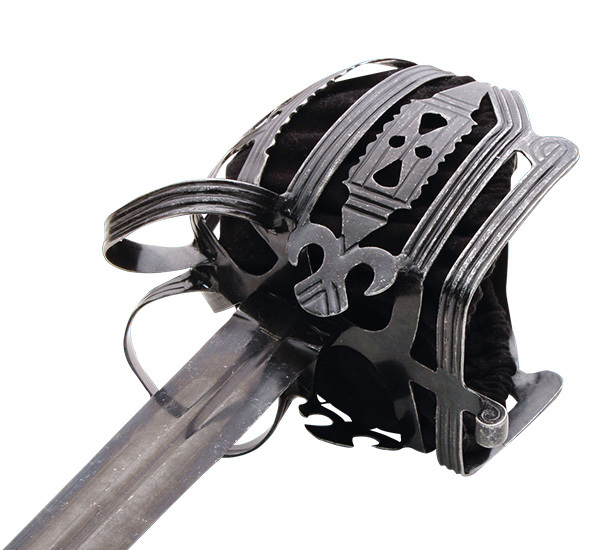 Think Medieval knightly army sword, and the Acre Sword stands apart from everything else. Tough, thin, & durable, this 39-1/4 inches long crusader sword weights around 3 lbs / 6 oz.